Ummm….OK lets get real. My guess is you are like the good majority of people who buy their running shoes based on fashion, not function. I don’t blame you, man have shoes gotten funky! I do admit to having a brightly colored pair myself which my son has nicknamed my super hero shoes! But I see an alarming amount of people unknowingly wearing what are called minimalist shoes. I would venture to say about 60 percent of my classes are sporting a pair. Now I am not saying this type of shoes is bad, but what I want you to know is that the way we are training in them is a problem. 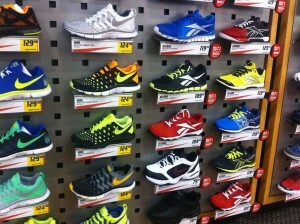 Question: When you removed the labels from your new shoes did you happen to read any of them? 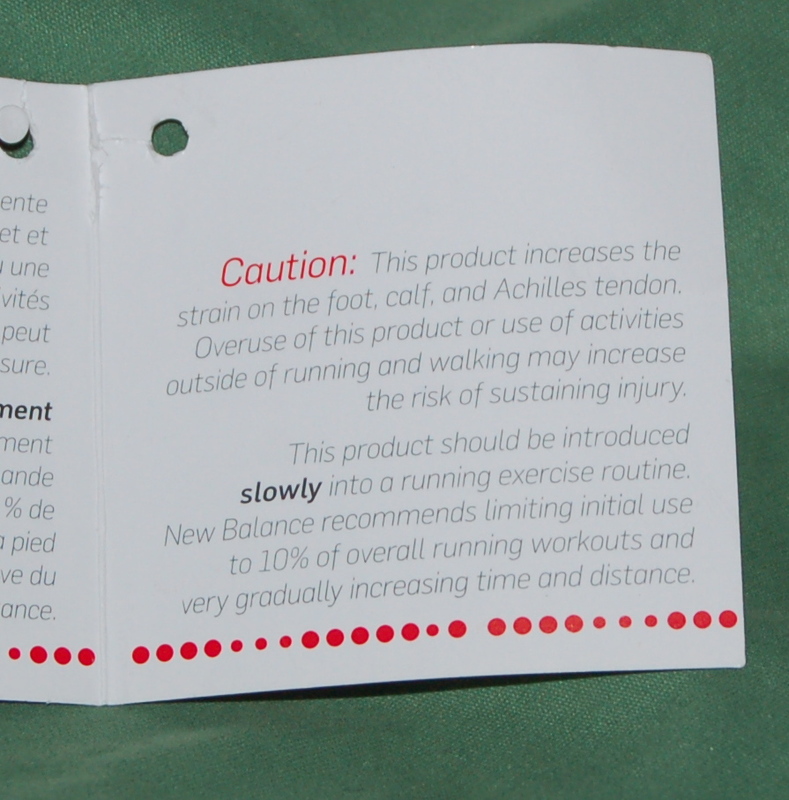 If you had you may have noticed some of them are starting to come with caution labels like this one. Did you know that your feet and ankle contain 1/4 of the bones in the human body? and 33 joints with over 100 muscles, ligaments and tendons! Your feet where made to sense the ground you walk on, absorb impact, leap, tip toe, swim, stomp, run, dance and get you where your going. But if your feet have not had the freedom to move au naturel you are going to have to take the time to train them up to do so. 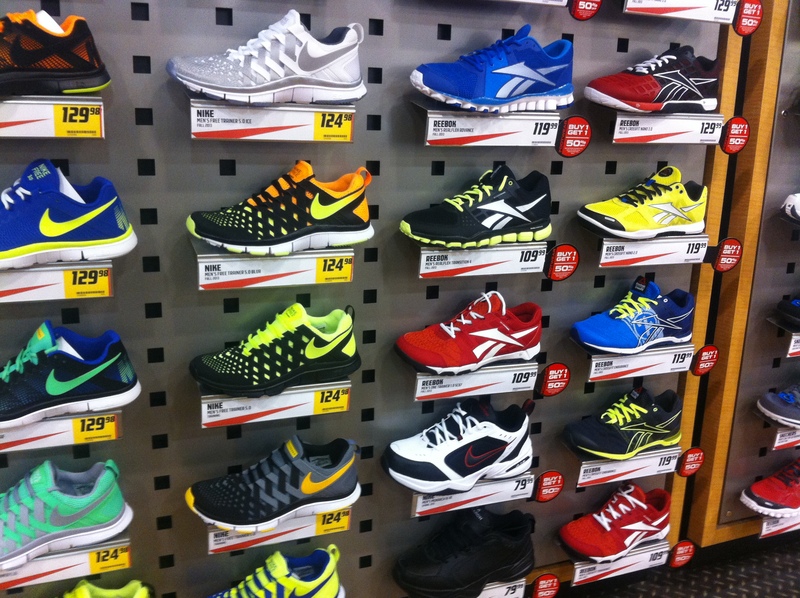 Here are some clues that your shoes maybe minimalist. 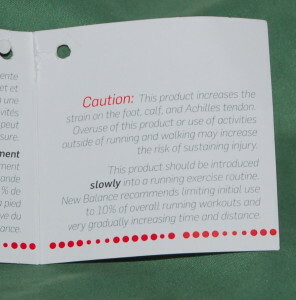 Unfortunately some of you may now be realizing as your reading this article why your heel, ankle, foot or Achilles has been bothering you it’s called over training. If you wear this shoe for all of your training right from the get go your muscle does not have enough time between training to adapt. I ran my half marathon in the fall with a minimalist shoe. I did part of my training in the beginning with a more structured shoe and a couple runs a week with the minimalist shoe. By the end of my training I was wearing my “super hero” shoes for 100 percent of my runs. I still taught specific classes at the gym in my structured shoes why? cause I followed this key principle; I trusted and listen to the signs my body was giving me. As a trainer I find there are 2 ends of the spectrum. (1) There are those that keep pushing the body when it is clearly in pain, they see the pain as standing in their way, rather than pain being a clear built in function of a body that is communicating a problem. Without pain we would do a lot of stupid and harmful things to our bodies! Pain is not as bad as we think it is. Pain is a problem when it is chronic yet we choose to ignore it OR numb it out with medication. Pain is our body asking us for unmet needs. Whether the needs are mental, physical, or spiritual. When over training in these shoes constant pain is just your body saying back off give me a chance to catch up! (2) The other end of the spectrum I find people who at every sign of pain they label themselves injured and quickly take themselves out of the game. FEAR of things getting worse plaques their training continuously. Either they just are inexperienced with the normal discomfort of an exercised body OR they have been injured in the past and are scared of going back. Here is what you need to know. Muscle that are challenged will become weak and during repair will exhibit pain. Trust that your body will build itself back up and the weakness will be overcome by strength and that it is just the way your body is made! Your body works to meet the demand that you place on it. So training in these shoes will result in your weak muscles feeling the burn. Just be patient, trust your body is communicating a good message with you, YOUR BODY IS NOT FIGHTING AGAINST YOU! Please remember this! Your BODY WAS MADE GOOD and it is FOR YOU! Learn to have a good relationship with the signals your body is sending you. Learn to back off without labeling it “failure” or “giving up” and in turn learn to push ahead and trust that out of your weakness you will become stronger.